For any evaluation, you’ll need a combination of options (evaluation methods) for different aspects of the evaluation. These options are useful for completing evaluation tasks related to collecting data, analysing data, reporting data, and making decisions about the evaluation. 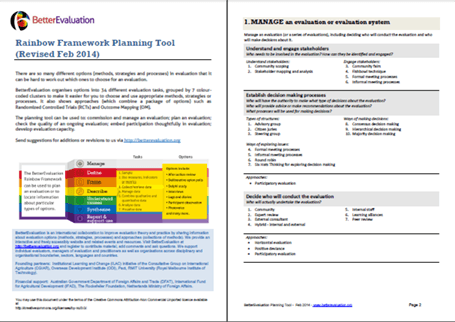 You can get an overview of the different tasks involved in evaluation, and the options for each of these by downloading the Rainbow Framework. Your Evaluation Plan will specify how you will collect and analyse data. It is useful to plan your data collection and analysis around a few Key Evaluation Questions. These are high level questions that the evaluation is intended to answer (for example, "How effective was the program?"). Was the policy implemented as planned? Did school attendance rates increase after the government abolished tuition fees at government schools? What caused these things to happen? Did the policy change contribute to increases in school attendance rates? What is the overall quality of what is being evaluated? Taking into account the negative impacts of the policy, was the policy overall a success? For each evaluation task you will find a range of options, each with their own advantages and disadvantages. An email questionnaire can gather data quickly – but response rates are often low, and it will not include those without technological access. A pen and paper questionnaire needs less technical support – but can be harder to distribute and collect and take longer to analyse. On each option page, you will find advice about when it might be appropriate to choose that option, taking into account available time, expertise and other issues. If you have a question about using a particular option, you can ask a question on the BetterEvaluation forum, or on other forums, such as EVALTALK and LinkedIn. When you have identified options that might be suitable for answering Key Evaluation Questions(KEQs), create a matrix of the KEQs and selected options. This will help you check that the planned data collection will cover all the KEQs, see if there is sufficient triangulation between different data sources, and help you design questionnaires, interview schedules, data extraction tools for project records, and observation tools, to ensure they gather the necessary data. KEQ1 What was the quality of implementation? KEQ2 To what extent were the program objectives met? KEQ3 What other impacts did the program have? KEQ4 How could the program be improved? Limited financial resources set boundaries for what options are feasible. For example, the resources stocktake options page describes a tool that helps with identifying gaps between the resources you have available and what you anticipate you will need. This prompts you to consider either leveraging additional resources or adapting the evaluation to work with the available resources. Plan the schedule of data collection, analysis and reporting and check there will be sufficient time to use these methods. For example, key informants might not be available to meet at the time when data are needed. Analyse the equipment and skills that will be needed to use these methods, and assess whether these are available, or can be obtained or developed. For example, collecting questionnaire data by mobile phones will require either that each data collector has a mobile phone or that there is a reliable system for sharing these among the data collectors. Given that not all can be anticipated at the start of an evaluation or certain conditions may change during the evaluation, you may need to revisit and revise the choices you have made. In these cases, document what was changed and why, and consider and document any implications these changes may have on the evaluation product and its use.